A gripping narrative history of Spain’s most brilliant and troubled literary family - a tale about the making of art, myth, and legacy - set against the upheaval of the Spanish Civil War and beyond. 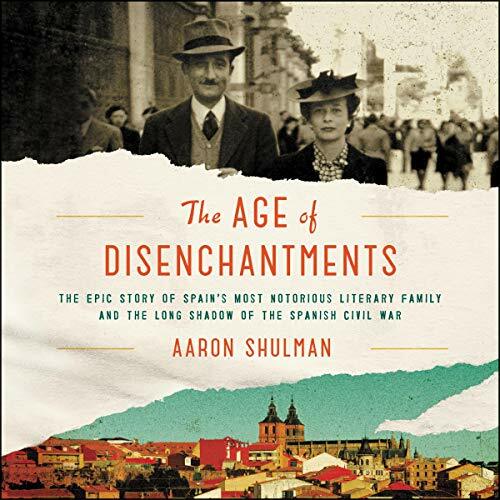 In this absorbing and atmospheric historical narrative, journalist Aaron Shulman takes us deeply into the circumstances surrounding the Spanish Civil War through the lives, loves, and poetry of the Paneros, Spain’s most compelling and eccentric family, whose lives intersected memorably with many of the most storied figures in the art, literature, and politics of the time - from Neruda to Salvador Dalí, from Ava Gardner to Pablo Picasso to Roberto Bolaño. Weaving memoir with cultural history and biography and brought together with vivid storytelling and striking images, The Age of Disenchantments sheds new light on the romance and intellectual ferment of the era while revealing the profound and enduring devastation of the war, the Franco dictatorship, and the country’s transition to democracy. The story was well-crafted and well-paced, and the subject matter riveting. This book deserved better narration or at least better editing. There were many mid-paragraph shifts in volume or tone. The reader’s pronunciation of Spanish proper nouns — while I imagine they were technically correct — came off as a bit exaggerated, especially when there was an awkward mid-sentence pause between English and Spanish. I found myself picturing a bad stage actor spinning around with a cape over his face to get into character.